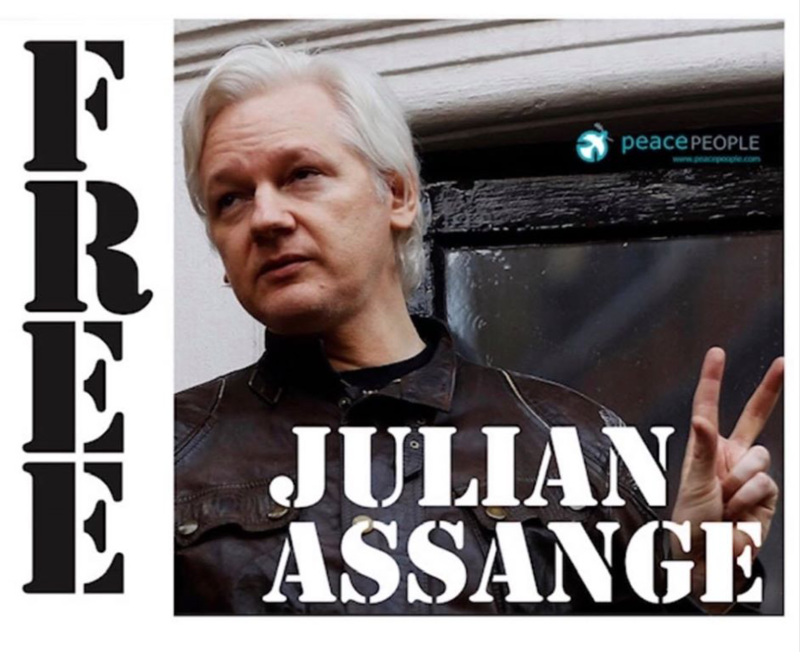 ‘Thursday 11th April, will go down in history as a dark day for the Rights of humanity, when Julian Assange, a brave and good man, was arrested, by British Metropolitan Police, forcibly removed without prior warning, in a style befitting of a war criminal, from the Ecuadorian Embassy, and bundled into a Police Van. It is a sad time when the UK Government at the behest of the United States Government, arrested Julian Assange, a symbol of Freedom of Speech as the publisher of Wikileaks, and the worlds’ leaders and main stream media remain silent on the fact that he is an innocent man until proven guilty, while the UN working Group on Arbitrary Detention defines him as innocent. The decision of President Lenin Moreno of Ecuador who under financial pressure from the US has withdrawn asylum to the Wikileaks founder, is a further example of Unites States’ global currency monopoly, pressurizing other countries to do their bidding or face the financial and possibly violent consequences for disobedience to the alleged world Super Power, which has sadly lost its moral compass. Julian Assange had taken asylum in the Ecuadorian Embassy seven years ago precisely because he foresaw that the US would demand his extradition to face a Grand Jury in the US for mass murders carried out, not by him, but by US and NATO forces, and concealed from the public. I visited Julian on two occasions in the Ecuadorian Embassy and was very impressed with this courageous and highly intelligent man. The first visit was on my return from Kabul, where young Afghan teenage boys, insisted on writing a letter with the request I carry it to Julian Assange, to thank him, for publishing on Wikileaks, the truth about the war in Afghanistan and to help stop their homeland being bombed by planes and drones. All had a story of brothers or friends killed by drones while collecting wood in winter on the mountains. I nominated Julian Assange on the 8th January 2019 for the Nobel Peace Prize. I issued a press release hoping to bring attention to his nomination, which seemed to have been widely ignored, by Western media. By Julians courageous actions and others like him, we could see full well the atrocities of war. The release of the files brought to our doors the atrocities our governments carried out through media. It is my strong belief that this is the true essence of an activist and it is my great shame I live in an era where people like Julian Assange, Edward Snowden, Chelsea Manning and anyone willing to open our eyes to the atrocities of war, is likely to be haunted like an animal by Governments, punished and silenced. Therefore, I believe that the British government should oppose the extradition of Assange as it sets a dangerous precedent for journalists, whistle-blowers and other sources of truth the US may wish to pressure in the future. This man is paying a high price to end war and for peace and nonviolence and we should all remember that.